Given that my blog has the word book in its name, I really ought to talk about books now and again. 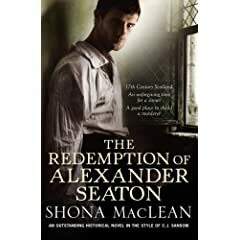 I've been reading some rather good books lately and here's a review (slightly amended) of one of them, The Redemption of Alexander Seaton by Shona MacLean. It appeared in the August 2008 issue of The Historical Novels Review. On a stormy night in 1626 in the Scottish town of Banff, the local apothecary's assistant collapses in the street. Next morning he's found dead in Alexander Seaton's house. Murder is suspected and when one of Alexander's few friends in the town is arrested, our hero sets out to clear him. But Alexander has a past. Having studied to be a minister of the Kirk, he had been denounced at his ordination for dishonouring the girl he would have married. The disgrace lost him not only his future wife, but also his vocation and his faith. Embittered and heartbroken, he took the only job open to him, that of a lowly schoolmaster. Now, in the course of his investigations, Alexander must deal with his fellow-citizens, good and bad. Some reveal themselves to be selfless and wise, others devious, greedy or unscrupulous. He must contend with inflamed prejudices that erupt in a witch hunt and with accusations of treacherous Catholic plotting. But above all, he must confront his own personal demons. This engrossing, atmospheric novel is a satisfying, skilfully constructed mystery with richly developed characters. But just as importantly, it's a vivid evocation of a particular time and place by an author whose uncle was the thriller writer Alistair MacLean and who is herself a historian specialising in 16th- and 17th-century Scotland. She has used her heritage and her skills to the full in creating this memorable and exciting read. Here's an interview with Shona MacLean in The Scotsman. Good review, Sarah. It's well outside my current period of interest, but it sounds so good, and that interview was interesting, too. This sounds interesting, especially if she can construct a plot as well as her uncle! I'll look out for it. Thanks for the review Sarah, sounds interesting. The cover grabbed me because it's another Rostant - note the window from The Scarlet Lion, nicely disguised unless you're in the know!